Although cytosine methylation plays a key role in regulating gene expression, including expression of transposable elements such as endogenous retroviruses, its role in kidney development is unknown. Using genome-wide methylation analysis in a mouse model, the authors showed dynamic changes in methylation of gene promoters and enhancers in developing kidneys. Genetic deletion of de novo methyltransferases in nephron progenitor cells did not lead to developmental alterations, whereas deletion of Dnmt1, which encodes a maintenance hemimethylase, caused a severe kidney developmental defect. Dnmt1 deletion resulted in a marked loss of methylation of transposable elements, accumulation of endogenous retroviral transcript, and activation of viral sensing pathways and cell death. 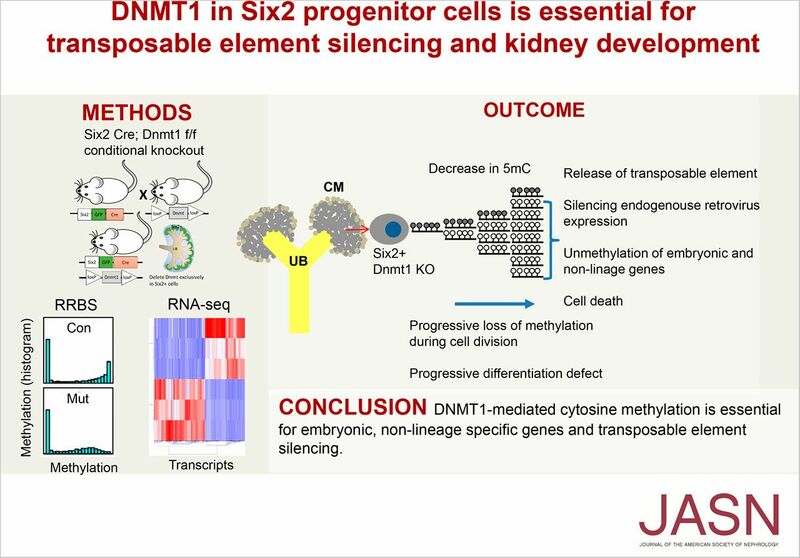 These findings indicate that DNMT1-mediated methylation to silence embryonic nonrenal lineage genes and transposable elements is essential for kidney development. Background Cytosine methylation of regulatory regions, such as promoters and enhancers, plays a key role in regulating gene expression, however, its role in kidney development has not been analyzed. Methods To identify functionally important epigenome-modifying enzymes and genome regions where methylation modifications are functionally important for kidney development, we performed genome-wide methylation analysis, expression profiling, and systematic genetic targeting of DNA methyltransferases (Dnmt1, Dnmt3a, and Dnmt3b) and Ten-eleven translocation methylcytosine hydroxylases (Tet2) in nephron progenitor cells (Six2Cre) in mice. Results Genome-wide methylome analysis indicated dynamic changes on promoters and enhancers during development. Six2CreDnmt3af/f, Six2CreDnmt3bf/f, and Six2CreTet2f/f mice showed no significant structural or functional renal abnormalities. In contrast, Six2CreDnmt1f/f mice died within 24 hours of birth, from a severe kidney developmental defect. Genome-wide methylation analysis indicated a marked loss of methylation of transposable elements. RNA sequencing detected endogenous retroviral transcripts. Expression of intracellular viral sensing pathways (RIG-I), early embryonic, nonrenal lineage genes and increased cell death contributed to the phenotype development. In podocytes, loss of Dnmt1, Dnmt3a, Dnmt3b, or Tet2 did not lead to functional or structural differences at baseline or after toxic injury. Conclusions Genome-wide cytosine methylation and gene expression profiling showed that by silencing embryonic, nonrenal lineage genes and transposable elements, DNMT1-mediated cytosine methylation is essential for kidney development.